One of the major reasons why you would probably use Foursquare are the cool mayorship titles that you get to earn once you’ve checked on a particular location for several times. 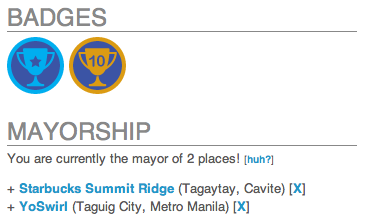 You earn the mayorship title and you get to share the information with your Foursquare friends. This mayorship title must be so coveted that some Foursquare users are gaming the system – that is checking in on place even if they have not visited the place at all. Some honest Foursquare members knew about this and have asked Foursquare to resolve the issue. The folks at Foursquare admitted that validating every user check-ins is quite a tricky task. But still, they’ve managed to come up with work-arounds to ensure that all check-ins made by Foursquare membes are legit. Recently Foursquare started utilizing the GPS features of most mobile phones to track whether the check-in made by a user is legitimate. For users with phones that have no GPS, Foursquare says that they are using a different trick, although it was not mentioned what that trick is. While there maybe some other ways by which the current system, GPS might still be tricked, what’s important here is the fact the Foursquare is very clear that awarding of badges and mayorship titles are done as truthfully and efficiently possible. After all, Foursquare’s main purpose is to let you share places you’ve visited with your friends. I really couldn’t understand why you want to attain mayorship of a particular place even if you’ve never been to that place. And you get to tell your friends about it? That’s pretty weird, right? In short, Foursquare is a serious social networking service so us, being Foursquare members should take it upon ourselves to use it truthfully.